Misha lives a life apart from most Soviet citizens. His father being one of Stalin’s private secretaries, his home is within the Kremlim, his plate is always full (even when the German betrayal in early 1941 brings food shortages) and his path towards membership of the Communist Party looks to be quite smooth. But Misha isn’t blind to the fact that the foundations of his society are built over the graves of communism’s victims. Ever since his mother was arrested (and presumed executed) on exaggerated charges of treason, he’s been well aware that his is a world where the truth can only rarely be whispered and rumours can get you shot. Yet he knows also that Stalin is not the statue or the poster that he is to others, but a mulish chain-smoker who has to be cosseted and coaxed into making a decision, and who fully understands the power of propaganda. The onslaught of the Nazis, crossing hundreds of miles of Soviet lands within weeks, promises to change everything, though. As even some within Stalin’s inner circle begin to contemplate defeat, fingers begin to be pointed. It’s not safe to be a boy with doubts about communism when that happens. 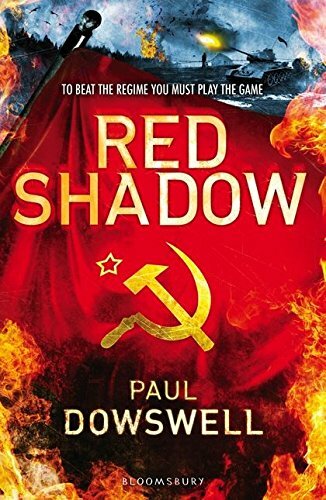 Of all the Paul Dowswell books I’ve read, this is probably the most uneventful. Misha doesn’t have the kind of adventure many of Dowswell’s other heroes do. Indeed, he is largely trapped, on every level, and that’s what the novel is really about – his growing awareness that everyone in the Soviet Union is a prisoner of some sort, and that some people are hoping to get better gruel by currying favour with the guards. Building on what he did in Sektion 20, Dowswell depicts life in a dictatorship as increasingly cloying, a house of cards that everyone is pretending is a beautiful castle built on a rock, and those who don’t pretend hard enough need to be cast out. It’s a suffocating existence, and by the time the Nazis appear to be closing in, they seem largely a metaphor for who else has already tried to crush Misha, his friends and his mother. This entry was posted in Reviews, YA fiction and tagged paul dowswell by Jonathan. Bookmark the permalink.